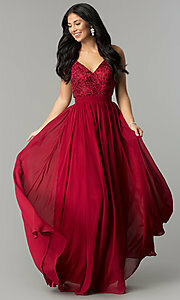 Spice up your look wearing this burgundy red long prom dress. At well under $200, you can dress to impress for less wearing this long red dress. The chiffon evening gown features a sleeveless v-neck bodice adorned with floral embroidery and tonal beading that shimmers with movement. Providing support and an alluring feature, thin shoulder straps criss cross the back of the burgundy red open-back formal prom dress. Banded at the natural waist, the a-line chiffon skirt flows to a floor-length hem. Ideal for prom 2019, galas and winter formals, this burgundy red chiffon prom dress is beautiful and affordable.